I saw an interesting blog last week written by Mike McBride of ChildAbuseSurvivor.net. Mike writes about abuse as an adult male who was abused as a child. 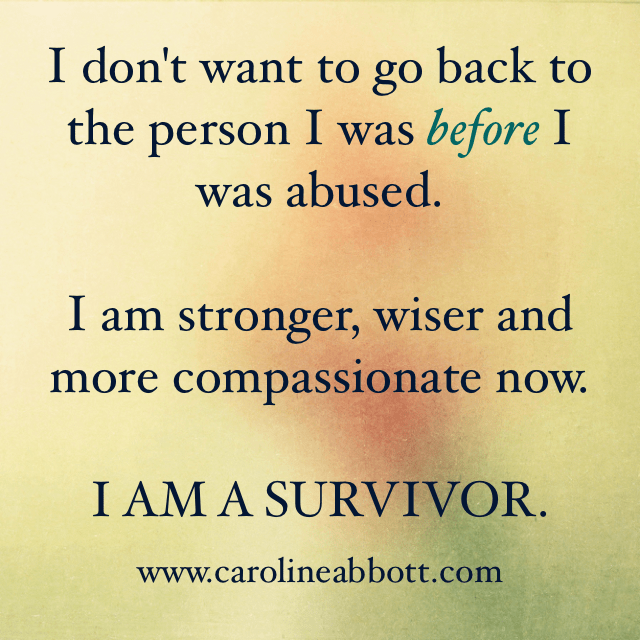 In his blog, he talks about healing from abuse, and growing older. He says many abuse survivors try to heal so that they can get back to the person they were BEFORE they were abused. Could it be if don’t admit we’ve been abused, it will somehow go away? (Of course not). Or if we wish away the abuse, we could become the innocent, happy “before” people we once were? Speaking for myself, I say no. I don’t want to go back to that “before” version of myself. That version of me was innocent of the evil some people contain, yes. But I have grown in more ways than I can count. I am infinitely stronger than I was. I have lived through hell and survived it, and learned to thrive. I had to depend on God, and learned He is dependable. I had to reach out to strangers, and learned I could trust their kindness. I have spread my wings in ways I never would have. I never had ANY thought of becoming a domestic violence advocate, writing a book, creating a blog, or ministering to other abused people. God set me on this path, and while it has its ups and downs and I often wonder what I am supposed to do next, I have never doubted I was on the right road. So, again, I ask you, even if it WERE possible, would you WANT to go back to the person you were BEFORE your abuse? I probably would want to go back and be the person before that. Not that I don’t think there is much to be learned and much strength to be gained by the admission of having survived, but the dysfunctional years spent living in shame caused more harm than good. I do understand your point and I agree with it for some people, but for me, I spent so many years keeping it a secret that it only served to fuel the disease and darkness that those men sought to instill in my young psyche. I do love that God has guided you down this path, and that you will continue to touch lives, as this post has touched mine in ways I can’t explain quite yet, but every word I share with another survivor brings me one step closer to freeing myself from the evil. Thank you. Love your story It really touched me.